Mainly be used in whitening of thermoplastic, polyvinyl chloride(PVC), polypropylene(PP), polyester fiber, paint and ink, etc. The information of our products is for reference only. We are not responsible for any unexpected results or patent dispute caused by it. 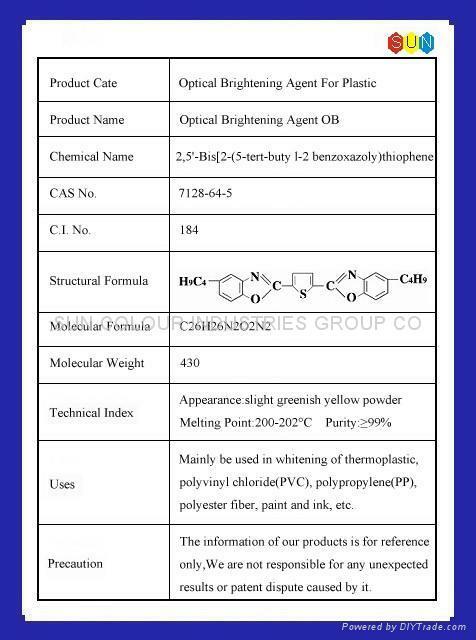 Uses： Mainly be used in whitening of thermoplastic, polyvinyl chloride(PVC), polypropylene(PP), polyester fiber, paint and ink, etc. Precaution ：The information of our products is for reference only. We are not responsible for any unexpected results or patent dispute caused by it.